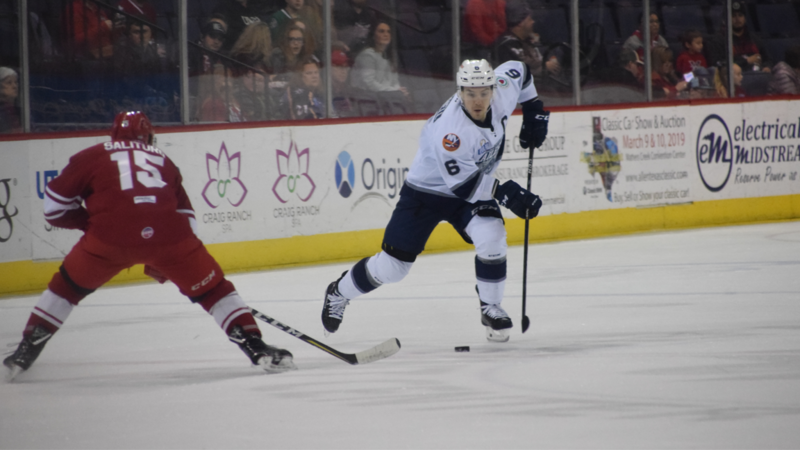 Allen, TX – The Worcester Railers HC (22-20-5-3, 50pts) continued their season long seven-game road trip with a 6-2 victory over the host Allen Americans (16-31-4-2, 38pts) in front of 3,991 fans at the Allen Event Center on Friday evening.Game three of the Railers road trip continues with an 8pm (ET) start in Tulsa, Oklahoma vs. the Oilers. Bo Brauer, Ivan Kosorenkov, Mike Cornell (GWG), Josh Holmstrom (1-1-2), and Barry Almeida (1-1-2) all scored for Worcester while Evan Buitenhuis made 32 saves in net and Yanick Turcotte picked up a pair of fighting major penalties and an assist. Tyler Barnes extended his point streak to a franchise record 11 games (10-5-15) with an assist as Worcester won for just the second time this season when trailing after 40 minutes of play (2-14-2). Worcester scored a franchise record five goals in the third period and scored a season high six goals overall as Allen netminder Kyle Hayton made 35 saves in the loss in net. Worcester had just under seven minutes of power play time in the first period but trailed 1-0 through 20 minutes of play. Braylon Shmyr (14th) snagged a rebound score at 16:58 for the only strike of the opening frame. Yanick Turcotte (8th FM) dropped the mitts against Emerson Clark in a physical period that saw Worcester outshot the Americans 19-13 through 20 minutes. After Yanick Turcotte (9th FM) dropped the mitts with Jacob Doty and Mike Cornell (7thFM) dropped Braylon Shmyr with a series of uppercuts in the first 12 minutes of the second period, the Railers finally broke through as Bo Brauer (3rd) struck on the power play with a snap shot from the left circle at 15:53 to tie the score at 1-1. But the Americans went back ahead less than a minute later as Dante Salituro (11th) ripped home a bouncing loose puck in the slot at 16:51 to give Allen a 2-1 lead through 40 minutes. The Railers would clobber the Americans in the third period with five goals to pull away with the 6-2 road victory. Ivan Kosorenkov (8th) tied the score at 3:45 after a give and go with Yanick Turcotte and Mike Cornell (4th) scored an unassisted tally with a 50-foot wrist shot at 5:23 for the eventual game winner. Josh Holmstrom (12th) made it 4-2 at 9:38 and Ryan Hitchcock (10th) added another at 15:18 which extended Tyler Barnes point streak to 11 games with an assist. Barry Almeida (14th) added the 5th goal of the period – a franchise record at 16:56 after a faceoff win by Ryan Hitchcock to give Worcester the 6-2 road win. Notes: Three Stars: 3rd star: Gary Steffes (assist) 2nd star: Evan Buitenhuis (32 saves, Win) 1st star: Mike Cornell (WGW, Fight) …. final shots were 41-34 in favor of Worcester…. Kyle Hayton (3-10-0) made 35 saves on 41 shots for Allen…. Evan Buitenhuis (8-8-4) made 32 saves on 34 shots for Worcester while Mitch Gillam was the backup…. Worcester went 1-for-6 on the power play while Allen went 0-for-2…. Kyle McKenzie (inj), Matt Schmalz (inj), Tommy Panico (inj), Connor Doherty (inj), David Quenneville (ill), and Malcolm Gould did not dress for Worcester…. defenseman Robert Powers made his debut for Worcester after he was acquired from the Indy Fuel earlier in the week for Woody Hudson and picked up a power play assist and was +2…. Bo Brauer played defense for the 2nd straight game and scored from the point on the power play….Jeff Kubiak is on recall with the Bridgeport Sound Tigers….Tyler Barnes now has a franchise record 11-game point streak (10-5-15) with an assist….Ryan Hitchcock now has 18 points (9-9-18) in his last 13 games for the Railers….Tyler Barnes, Nick Sorkin, Matty Gaudreau, and Yanick Turcotte also added assists for Worcester…. the Railers are now 9-12-1-2 on the road this season and 1-0-1-0 on their season long seven game road trip…with the three fighting majors the Railers now have 33 fighting majors this season…..Barry Almeida had a game high seven shots on goal….it was the 2nd time this season the Railers won when trailing after 40 minutes of play (2-14-2)…Ryan MacKinnon finished +4…the two teams combined for 50 penalty minutes. The Railers season long seven game road trip continues Saturday, Feb 16 with an 8pm (ET) faceoff in Tulsa, OK vs. the Oilers. Coverage begins at 7:35pm (ET) on 98.9 NASH Icon. Railers cough up three goal third period lead and fall 5-4 in overtime in M... THE PLAYOFF PUSH IS ON!